In modern earthquake engineering, design for seismic isolation has become increasingly important for the prevention of devastating damage in a major earthquake. One effective and practical method for seismic isolation is the use of friction pendulum bearings, of which many may be used in a bridge structure. 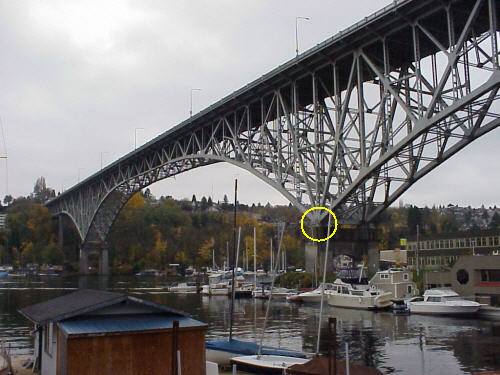 In this Brief, we present the modeling and use of friction pendulum bearings for the seismic isolation of the Aurora Bridge (see Figure 1) that spans Lake Union in Seattle, Washington. A typical location of these frictional bearings is marked in the figure. As shown in Figure 2, a friction pendulum bearing consists of a stainless steel concave dish and a stainless steel articulated slider surfaced with a composite liner. During an earthquake the slider moves back and forth on the concave dish; the spherical surfaces of the slider and the dish define a motion similar to that of a pendulum. The composite liner produces a frictional force that is 5 to 7% of the vertical force acting on the bearing. The bearing isolates a structure from an earthquake through pendulum motion, and absorbs earthquake energy through friction. Using contact surfaces with friction, a friction pendulum bearing model is implemented in ADINA as shown in Figure 3. The dish is modeled with a spherical rigid contact surface. The slider is modeled with just two tetrahedral elements. 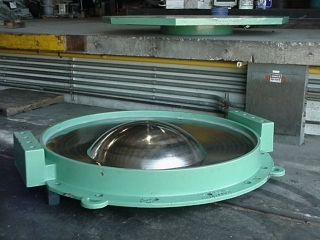 The opposing contact surfaces (slider and dish) are defined as a contact pair with a coefficient of friction equal to that specified for the bearing. The movie at the top shows the overall (magnified) response of the Aurora Bridge under seismic loading. The movie below shows the response of one of the friction pendulum bearings under the same seismic loading. The analysis of structures subjected to earthquake loads, like buildings and bridges, requires very reliable and effective analysis tools. ADINA with its advanced and proven nonlinear analysis capabilities is widely used for simulations in seismic engineering.